Camp Crystal Meph (yep, that’s the best joke in the movie) reopens as – to quote the irate owner – “a retard petting zoo” decades after a series of murders committed by scurvy-afflicted madman Johann Van Damme. Her face reattached after an earlier encounter with the bald, disfigured killer, a lone survivor returns to settle the score. 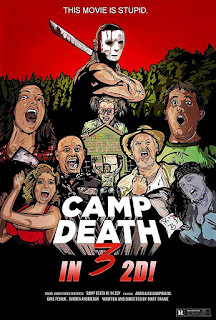 This shrill, self-consciously wacky spoof – complete with gurning performances and sped-up action – runs out of workable FRIDAY THE 13TH gags early on, so follows the desperate example of the SCARY MOVIE sequels by resorting to random parodies of STAR WARS, THE EVIL DEAD, et al. It also ropes in a tedious running gag with a puppet beaver and about 400 coarse alternatives to the word “retarded”. Director Frame apes the slo-mo, shrieking strings, fades to white, subjective camerawork and campfire exposition of the early FRIDAY THE 13TH movies while throwing in a pointless OTT spoof of PART V’s meatcleaver-wielding shrill harridan Ethel. Her musical rendition of the standard FRIDAY “You’re doomed!” warning and an enthusiastic death-by-toaster are rare highlights in a laugh-lite affair recommended to those who find hilarity in paraplegics being kicked repeatedly, gay stereotypes, “funny” foreigners and “Jokes” about transvestism and snot.